GHz band to the less-inteference 5 GHz space. while 2.4GHz 150Mbps for simple tasks, such as web-surfing, social media or e-mail. Soft AP & WPS Function: Soft AP Mode to create a Wi-Fi hotspot for mobile devices. WPS encryption method to remember and protect password. 1External Powerful Antenna:High Gain Long-Range 2dBi Antenna can help you connect even when signals are weak. 2Awesome speed: Maximum speed up to 5GHz 433Mbps or 2.4GHz 150Mbps. Ideal for gaming online and seamless HD video streaming. 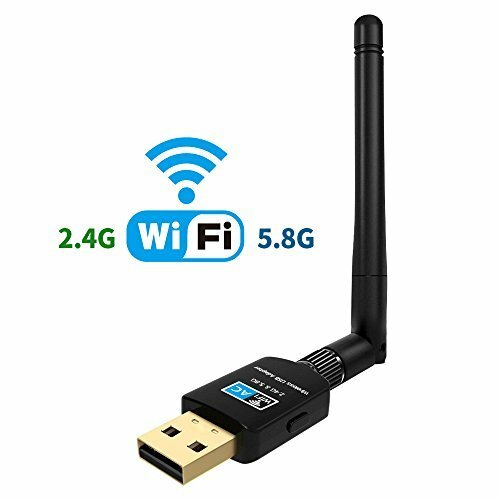 Ultra-fast AC600 wireless adapter speed with 802.11ac. 5Warranty: We offer 12 MONTHS WORRY-FREE WARRANTY, if you have any problems when using, please contact us first, we will help you make things right. If you have any questions about this product by suntrsi, contact us by completing and submitting the form below. If you are looking for a specif part number, please include it with your message.